I confess, I took these on May 13-14, since I knew I wouldn’t have time on the 15th (preparing to have a bunch of Kindergartners over for my daughter’s birthday party on Saturday, shouldn’t even be doing this right now, should be frosting cupcakes and picking up piles of toys and other messes, bad bad mommy etc etc). But I swear, all are still flowering today! So, here’s a pictorial tour of what’s out there at the moment. As I looked around, I realized that most of what’s blooming right now is very small in terms of actual flower size, and I was glad to have the excuse to stop and look a little more closely at them all. This is not by design, just haphazard planting, my usual style. 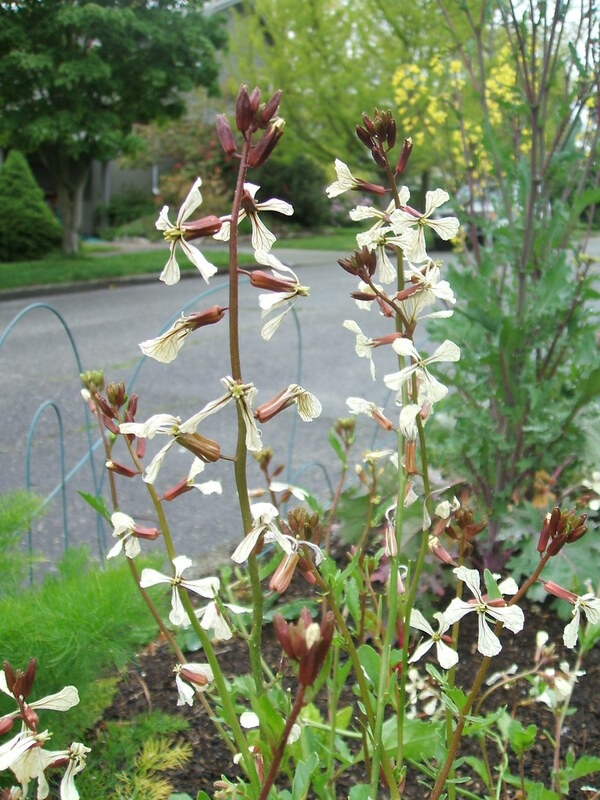 Beginning in the parking strip garden, I have held off ripping out bolting veggies and salad greens, instead just enjoying their flowers and letting the bees have a little something to snack on. This weekend, it will all go in the worm bin and I’ll plant (belatedly) the rest of my small veggie patch there. 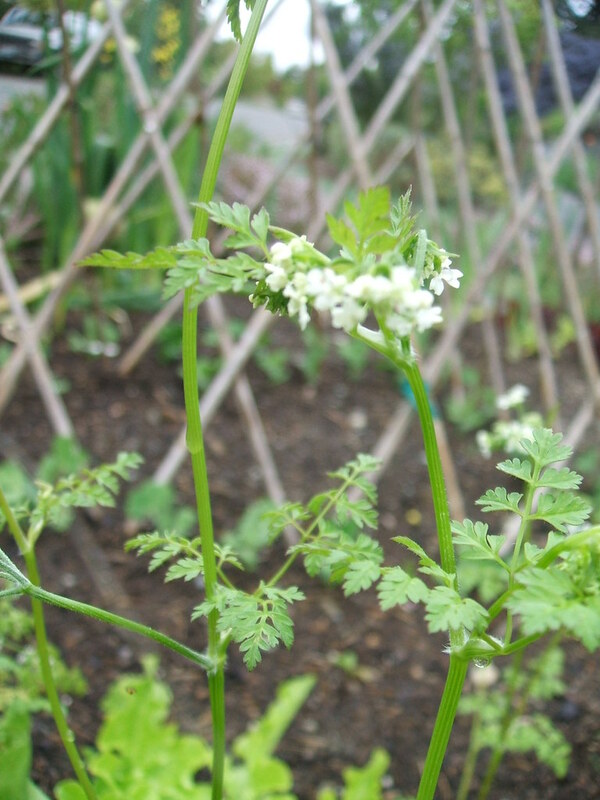 I thought this was Salad Burnet until Molly at Life on Tiger Mountain steered me in the right direction – its anise-y taste should have clued me in that it’s actually chervil. I’m letting it go to seed and hoping to see it return, as the taste is heavenly. I waited too long to harvest the Russian kale I planted last fall, and it went from baby leaves to huge tough inedible ones in a heartbeat. 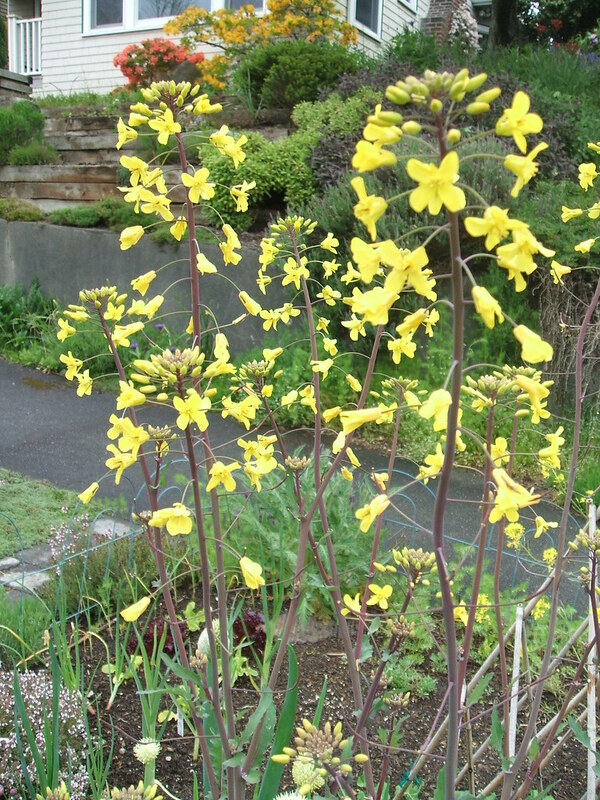 Oh well, I love the tall spikes of lemon-yellow flowers. 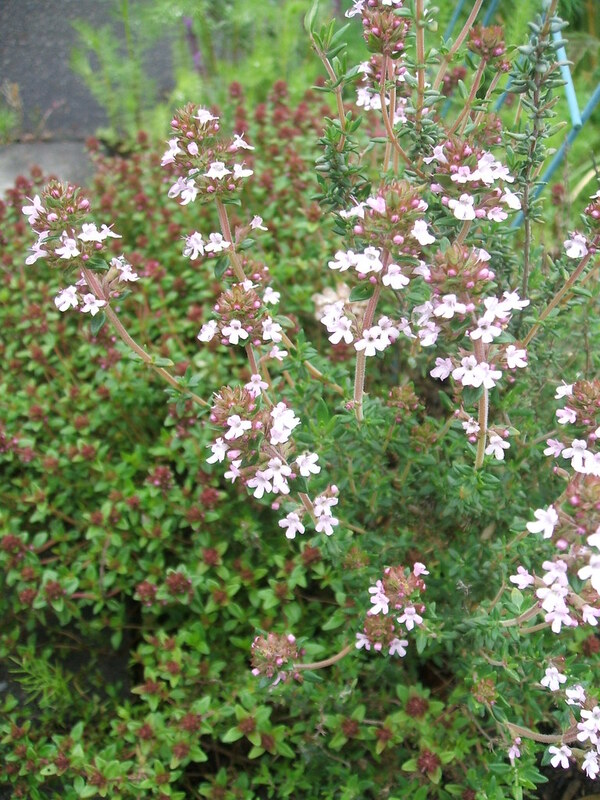 My camera couldn’t quite capture the color of this English thyme, the first one to bloom and covered in a profusion of tiny pink blossoms. 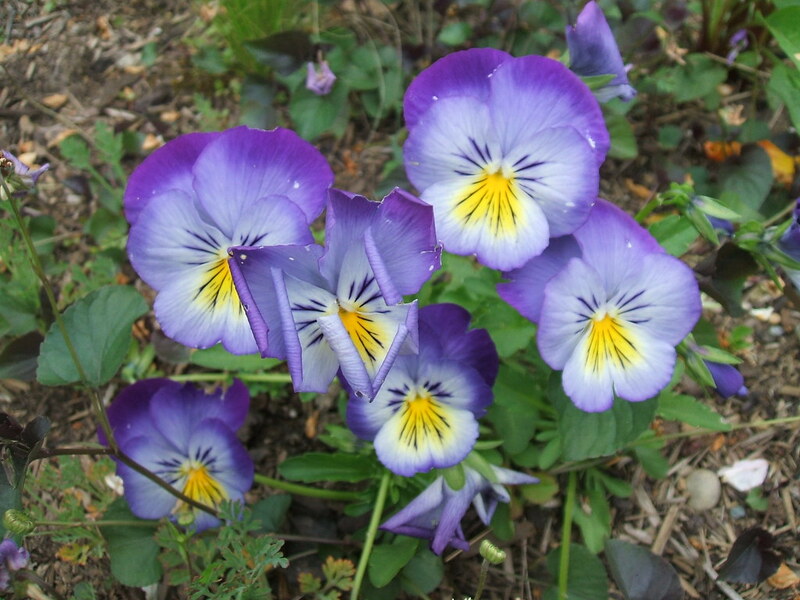 Moving away from the veggie patch to the wild rest of the strip, many of the self-sowers I rely upon to garden cheaply in this area have returned happily despite the awful winter. 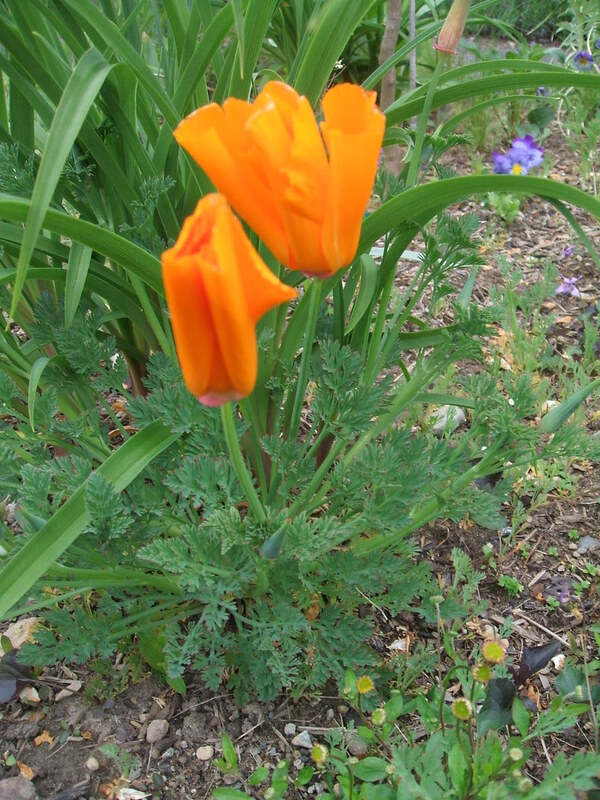 California poppies (Eschscholzia californica) have begun to bloom, along with Cerinthe major purpurascens (aka Honeywort or Blue Shrimp plant) and a few early calendulas. The strawberries, including Alpine, Tri-Star everbearing and Pink Panda ornamental, all are flowering nicely at the moment, but I won’t bore you with pictures, you know what they look like. Bulb season is pretty much over, since I don’t really have much in the way of late-spring/early-summer bulbs (c’mon allium, bloom this year, please, please??). 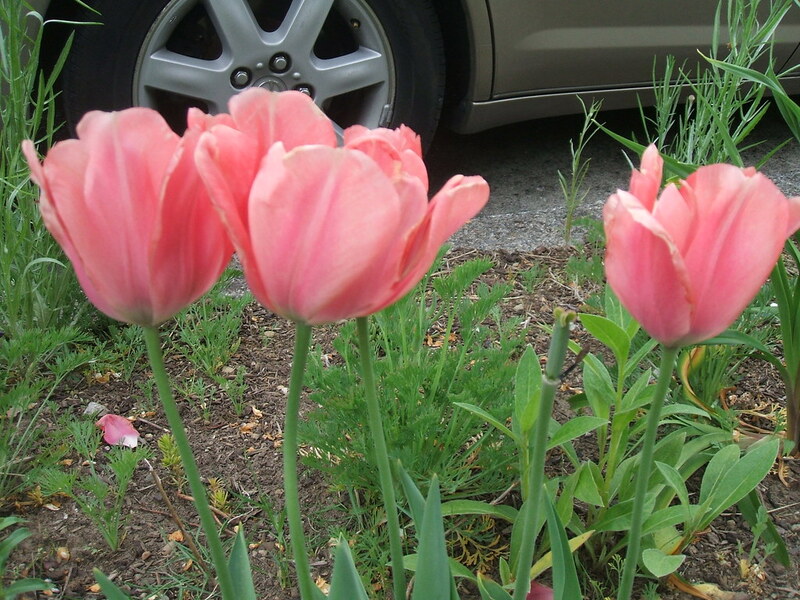 A few stragglers in the way of tulips remain. 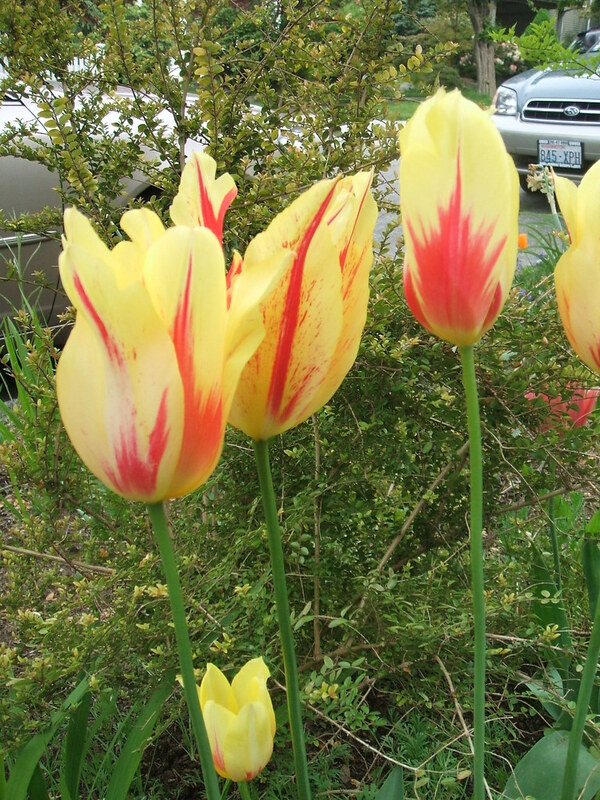 Moving up to house level, one last set of tulips, in various stages of decay. 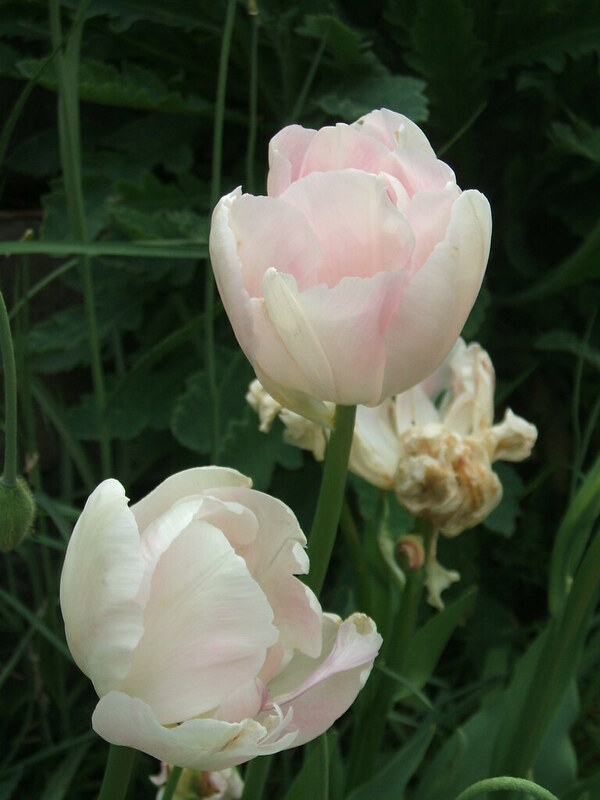 I think these are ‘Palestrina,’ unless they’re ‘Angelique.” Both are pale pink, and I know I’ve planted both in relatively the same area. Hm. 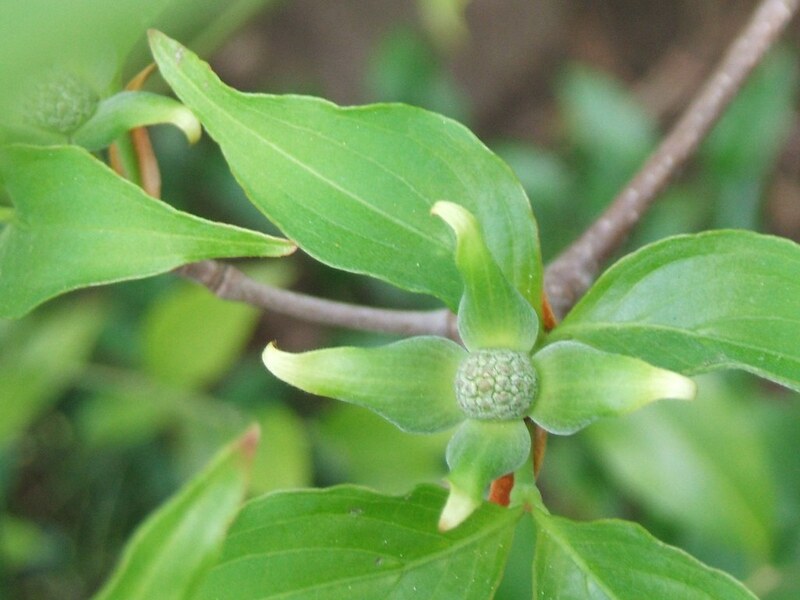 I pruned the red twig dogwood back a bit this winter, and now I realize I should have pollarded it to make the twigs show up better, since only the new growth is red. Maybe next year! 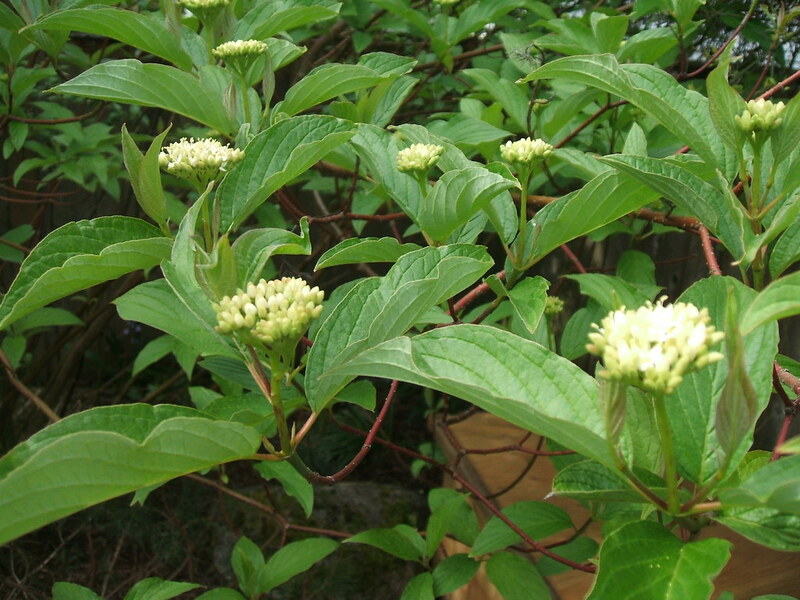 There’s a big dogwood of unknown variety behind my daughter’s room. 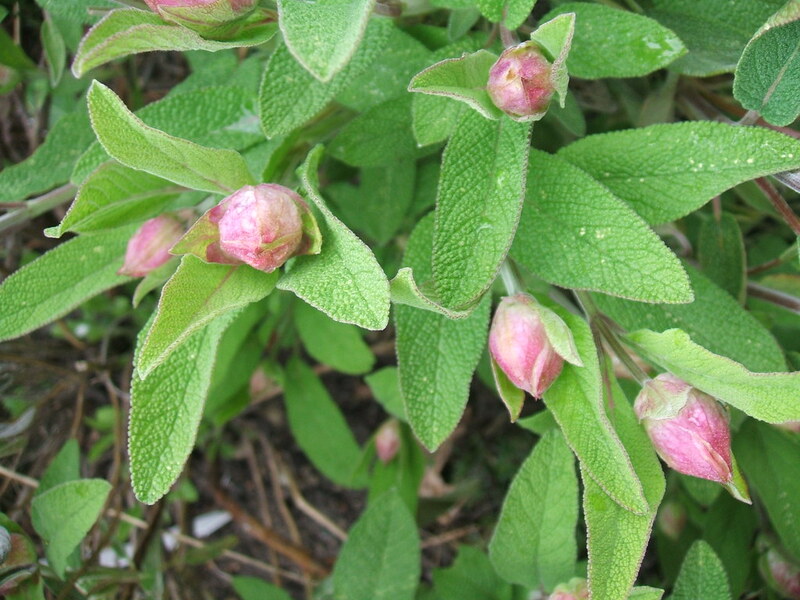 Its bright white flowers show up later in the spring, but right now it’s getting ready. 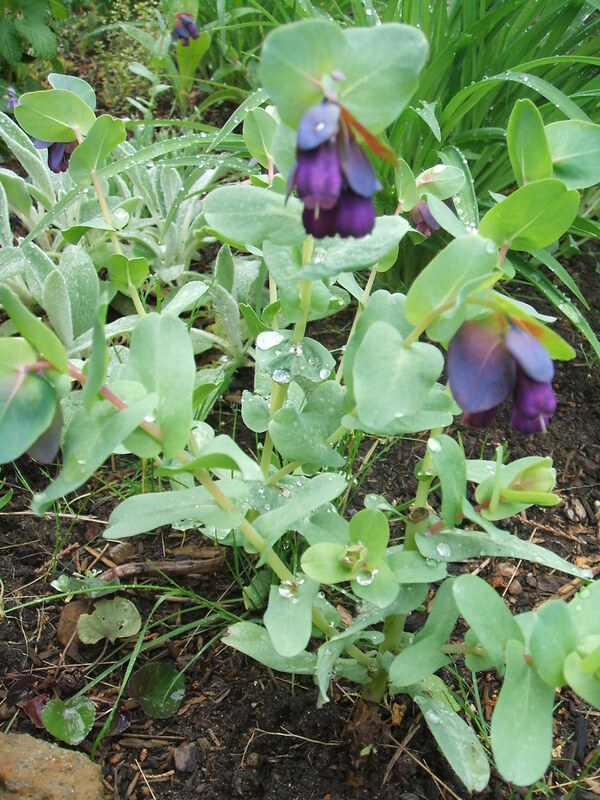 I’d never noticed its early-stage blooms before, they’re well-camoflaged in the leaves. More scilla. I always laugh when I see these for sale in nurseries! 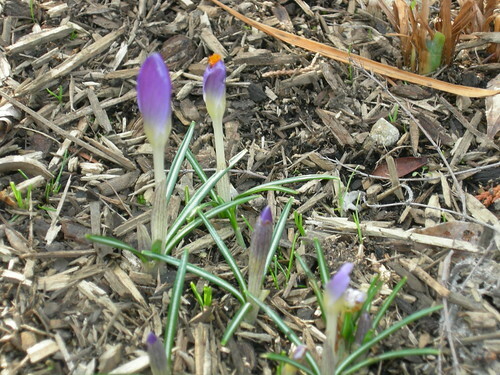 Please, come to my house and dig up some bulbs, don’t pay good money – it’s the weed of the bulb family for sure! 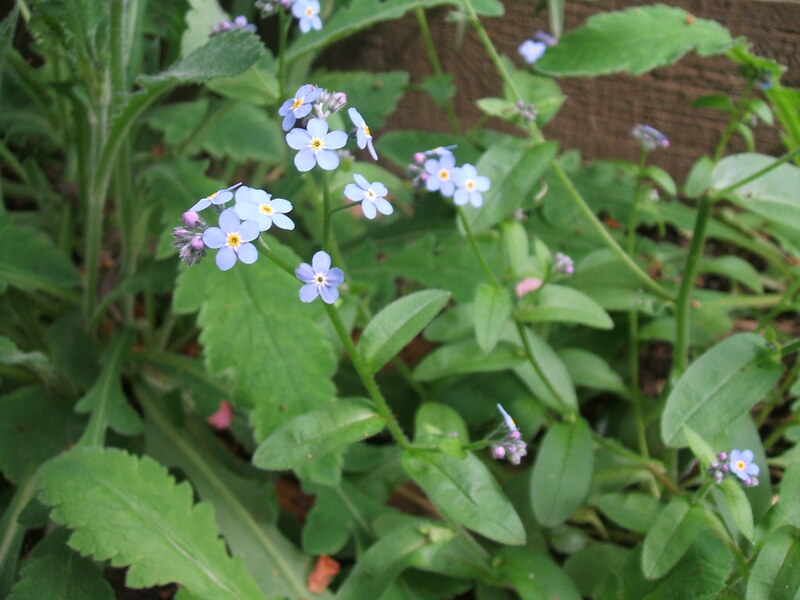 Another blue “weed” – I keep hoping for more Forget-me-nots to stray across from the neighbor’s yard. I guess I’ll just have to plant some one of these days. 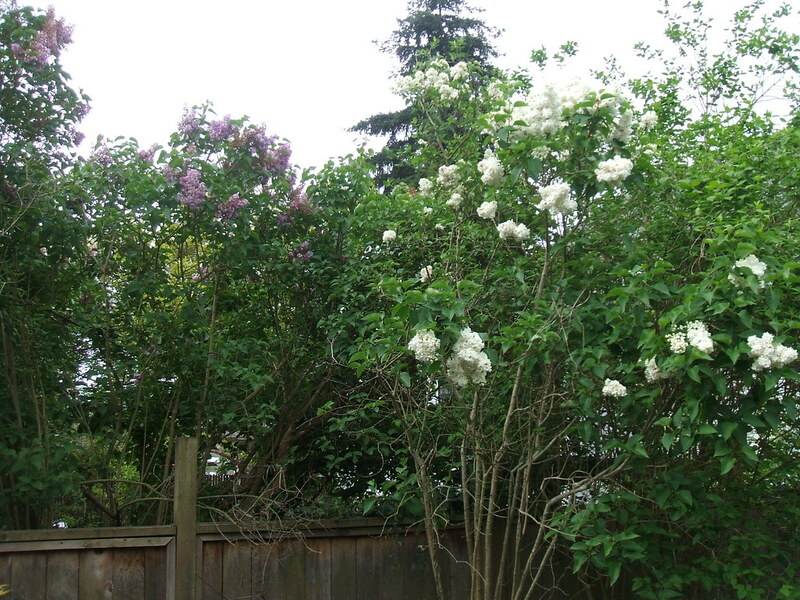 The neighbors on the other side have a purple lilac, and we have a white one. I like when they bloom together and have a conversation over the fence. Almost done here, thanks for reading this far if you are still with me! 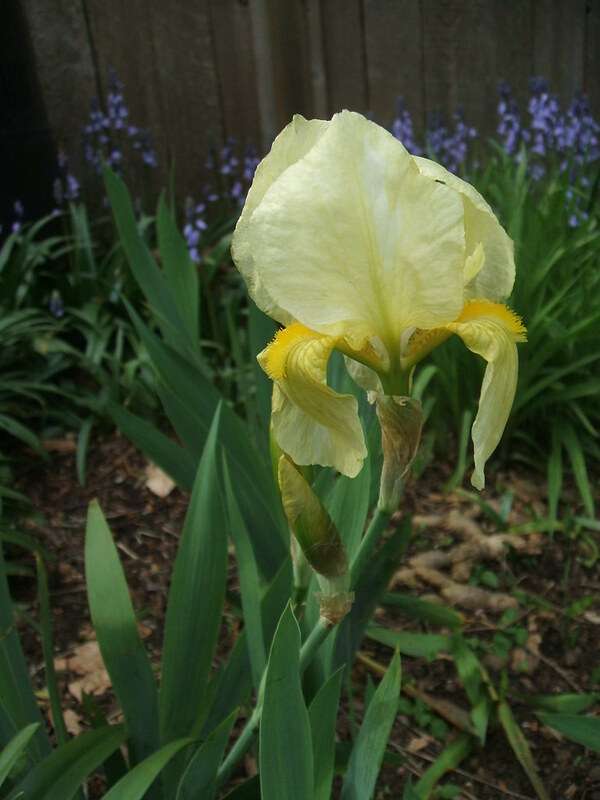 This iris was here when we arrived, but had never bloomed before. 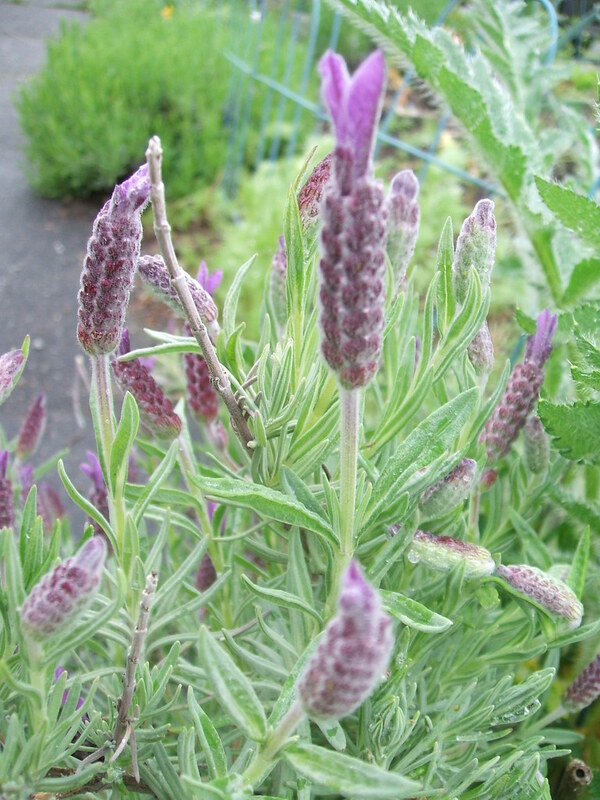 I hacked the butterfly bush way back this winter and maybe that gave it enough sun to finally flower. No idea what it’s called, but my great-aunts were big iris fanciers so seeing these always makes me think of those great ladies. 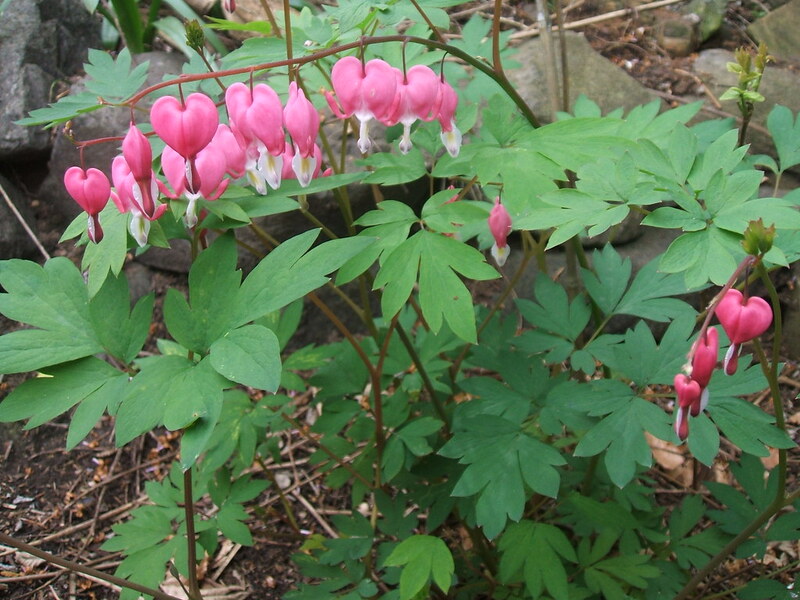 This poor bleeding heart (Dicentra spectabilis) is marooned back in a hidden corner next to the compost bins. I need to move it. Any idea when is the best time? OK, last one! 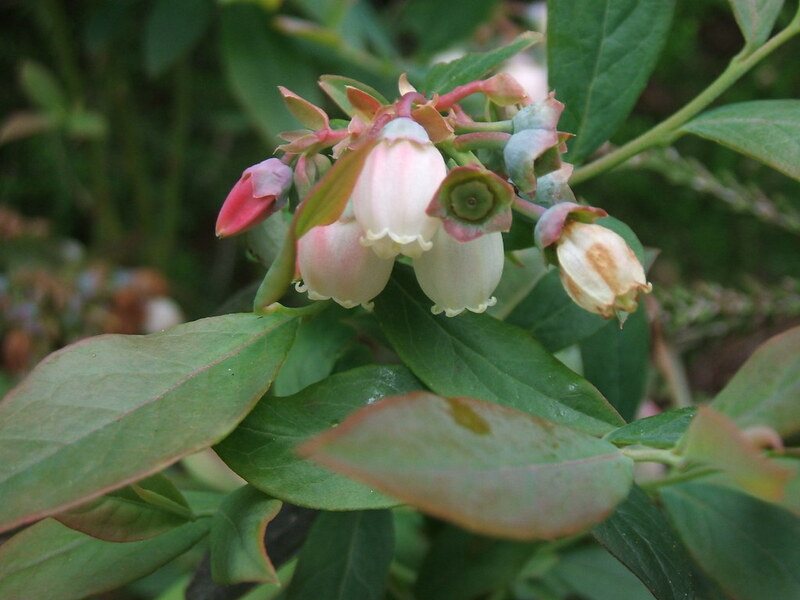 The blueberries I ordered and planted this winter are still blooming, but when I looked yesterday, the blossoms are starting to fall off and the little fruits are beginning to form. I don’t even really like blueberries all that much but this was probably the most exciting thing I found in the garden this week. I need to figure out how to protect them from the hungry birds and other critters. 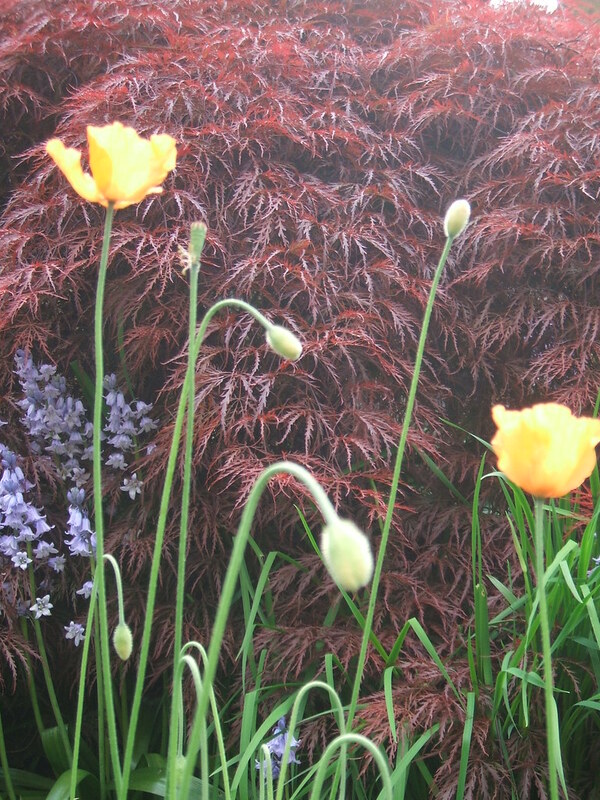 To see what else is flowering madly during these heady days of mid-May, visit Carol of May Dreams Gardens, monthly host of Garden Bloggers’ Bloom Day. This is, after all, her favorite month! Carol of May Dreams Gardens started the lovely tradition, three years ago today, of hosting Garden Bloggers’ Bloom Day on her site. 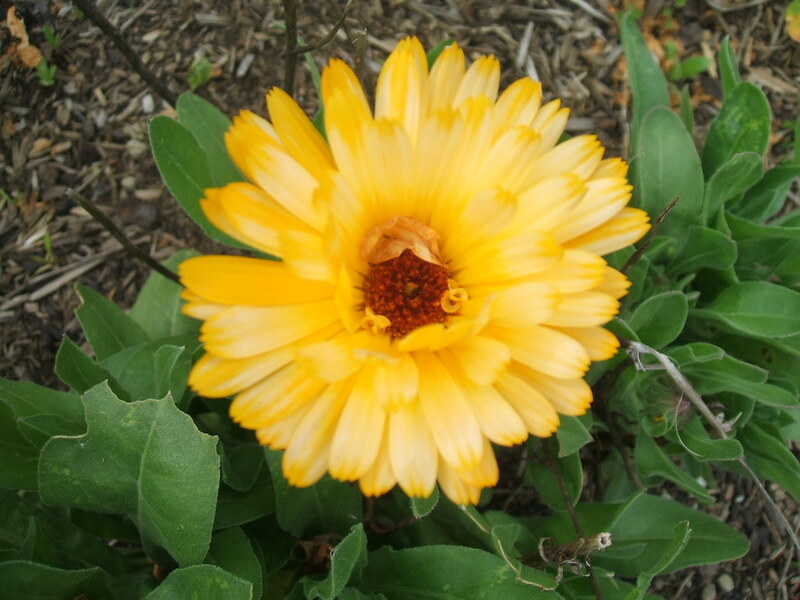 She invites gardeners worldwide to participate, showing what we have blooming on the 15th of each month. Indoors counts too, so those in colder climates can still join in during the winter months. 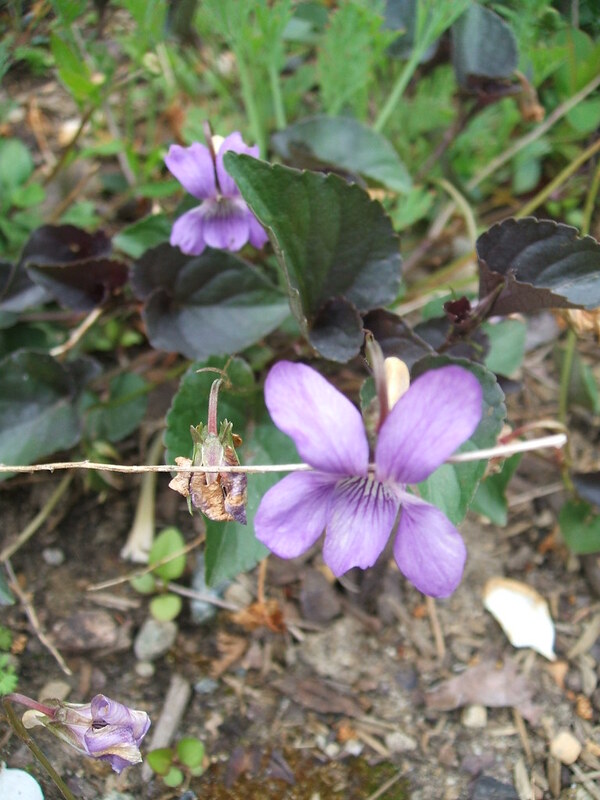 I participated for the first time last month, and really enjoyed seeing what everyone else had going on while all I had was witch hazel. Mostly things are so dull and dead-looking out there, I fell for the almost eye-stinging brights of some grocery store primroses. 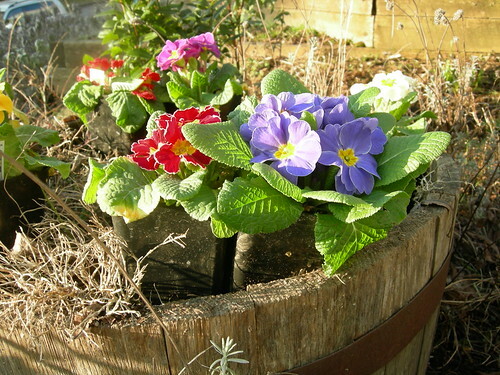 Then they have languished in their pots, since I have yet to unwrap the hose bibs from their winter protection so planting has not yet begun at my house. 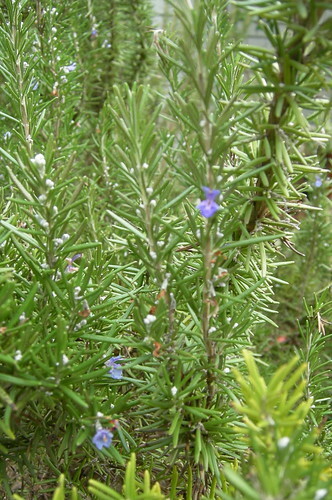 I thought my giant rosemary bush was going to be toast after being flattened numerous times by the snows. 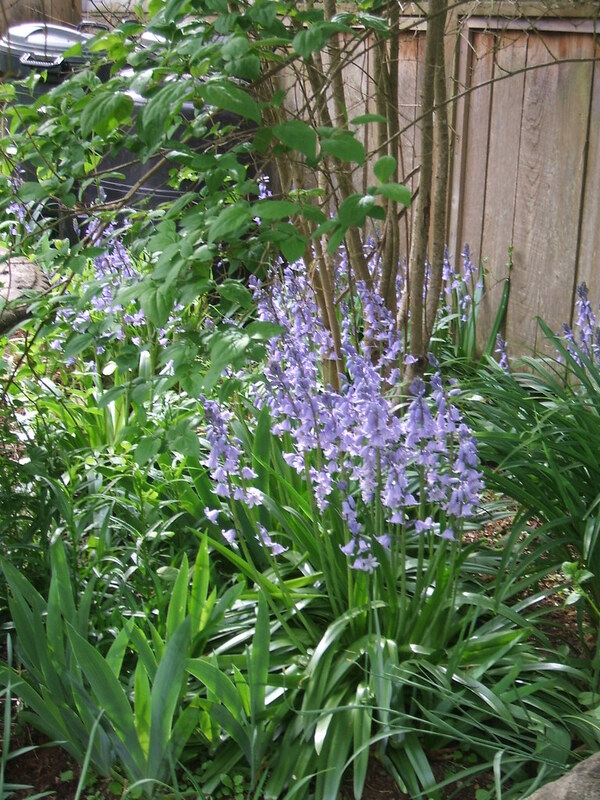 But here it is, hale and hearty and blooming once again, just in case the hummingbirds decide to stop by for a snack. 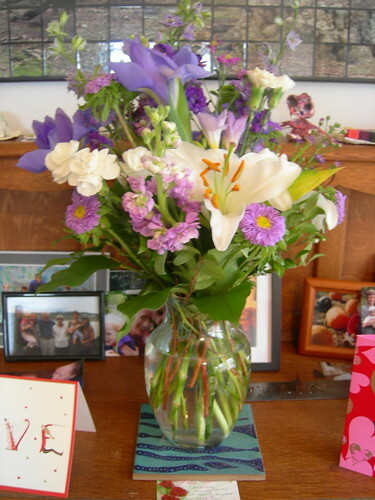 These don’t really count, since I didn’t grow them myself, but my dear sweet mother-in-law sent us a totally un-red/pink Valentine’s Day bouquet that is currently spiffing up the sideboard in our dining room. The lilies smell incredible! I know people’s opinions on garden tchotchkes run the gamut from love to detest, but I have allowed more of these in since I had a kid, and have tried to put them near plants that she might not notice otherwise. 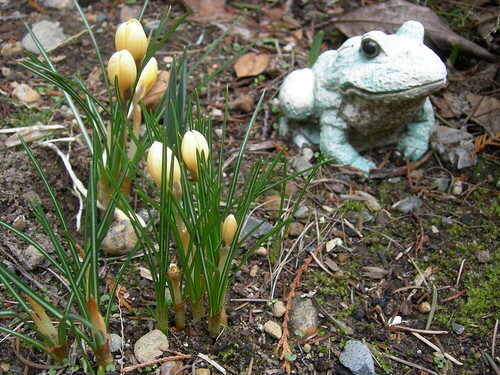 Hence, Mr. Frog here offers companionship to his little crocus friends, so we don’t forget to see them as we dash by on our busy ways.